Mai Chau is a district of Hoa Binh Province in the northwestern region of Vietnam. 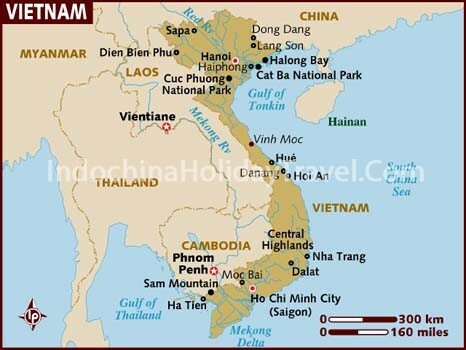 The district is located about 160 km from Ha Noi. The scenery of Mai Chau attracts many tourists. In 2003 the district had a population of 48,570. The district covers an area of 520 km². The district capital is the city of Mai Chau. A visit Endangered Primate Rescue Center then cycling along the forest road, riding through the jungle to gate of the national park, continue biking to Tam Coc, enjoy rowing boat trip through rice fields and limestone mountains to visit 3 caves in Tam Coc. Overnight in Tam Coc. Start cycling to Bich Dong where your lunch is prepared. Bich Dong is a pagoda on nearby Ngu Nhac mountain dating to 1428, comprising three structures: Ha, Trung, and Thuong Pagodas, in ascending order. Guided tours generally cover historical points and end with a pleasant view from the top..After lunch, continue your bike ride on hilly rural roads through countryside villages to Hoa Lu. Overnight in Ninh Binh. Start to pedal through the rich farming land of the Red River Delta to Hai Phong. You will have the opportunity to experience farming works by local farmers. In the afternoon, we will spend a short time to drive to Hai Phong. Overnight in Hai Phong. Have breakfast at the hotel, then start pedal to Ha Long Bay by bike in the morning . On the way will stop to visit some local market and rice field . Arrival Halong bay free for swimming and beach relaxing , dinner with seafood in local restaurant . Overnight in Ha Long. A short drive to the boat station for cruising, get on board, discover the World Heritage Site, visit the beautiful grottos and admire the scenery of the Bay from your boat. Drop anchor for swimming, and enjoy seafood on board. Continue cruising until the afternoon, disembark from your boat and cycling from Gia Luan to Cat Ba town and stay a night on Cat Ba island. Explore Cat Ba by bicycle in the morning: cycle to the National Park, central market, and fishing port. Relax on beach in afternoon, explore dinner by yourself , stay one more night in Cat Ba.